Bold, colorful, and stunning geometric designs with flying geese galore – that’s how you know you’re looking at one of Gail’s quilts! Her style has become immediately recognizable because of her talent for combing vivid colors with intricate piecework. Her geometric star quilts and pictorial quilts have won awards at shows throughout the U.S. and have been featured in publications worldwide. Students love her ability to make these designs achievable even for novice quilt designers. Gail will be the featured quilter at AQS QuiltWEEK Daytona Beach 2018 with 20+ of her quilts on display! She also was featured at AQS QuiltWEEK Albuquerque 2015 in the retrospective exhibit, “From the Land of Enchantment: Thirty Years of Quilts by Gail Garber”. They produced a video tour of the exhibit which can be viewed here. She is the featured guest on the current season of The Quilt Show with Ricky Tims and Alex Anderson. Her quilts have won awards at shows throughout the U.S. and have been featured in publications worldwide. Author of three books and >100 magazine articles, Gail judges quilt shows, conducts workshops, and lectures throughout the U.S. and abroad. From novice level classes that take the mystery out of paper foundation techniques and curved seam piecing to intermediate classes focusing on original design, students love her ability to make every student successful. For Gail, quilting began as a whim, when friends convinced her to take a hand-quilting class. Quiltmaking quickly became a passion. Gail’s early quilts are traditional with conservative fabric choices. By 1984, she began exploring original design. In 1990, she purchased her first BERNINA machine, the 1230 model that she still owns and still uses. She later joined the Bernina Amabassador Program and worked her way through a variety of different models, but her all time favorite is her BERNINA Artista 730 because it can sew through anything without missing a stitch! 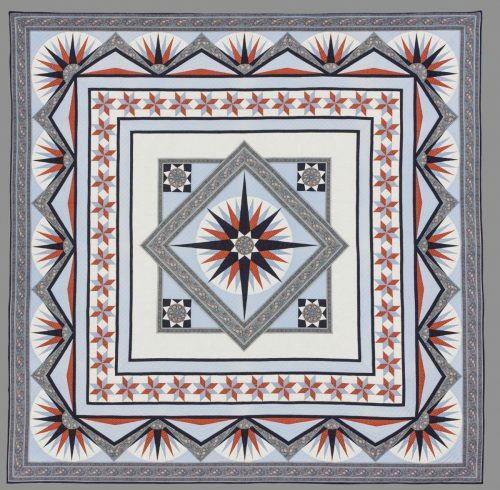 Her first effort, Azimuth, is a king-size medallion style quilt that features a Mariner’s Compass in the center and variations of the compass throughout the quilt. This award winning quilt has been displayed at quilt venues throughout the U.S. and overseas. It is now in the collection of the National Quilt Museum in Paducah, KY along with another of Gail’s signature quilts, “Cosmic Parade”. Cosmic Parade was featured on the cover of her second book, “Stellar Journeys”. Today, Gail lectures and conducts workshops to quilters throughout the U.S. and abroad. Her classes for novices include instruction in color and composition, introduction to freezer paper foundation piecing, and drafting, drawing and design. For the experienced quilter, Gail’s classes in design are popular wherever she travels. She also leads tours for quilters and birdwatchers to exciting “off-the-beaten-path” locations. 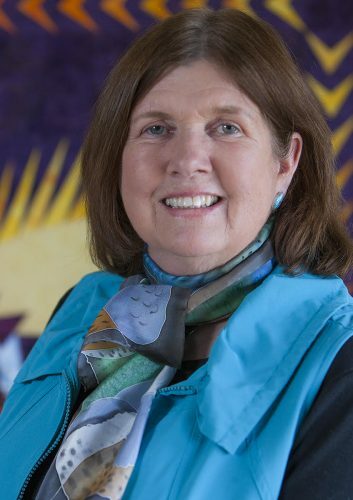 In her other life, Gail is the Executive Director for Hawks Aloft, a New Mexico conservation organization. This organization was founded by Gail and others in February 1994. They conduct education and research programs to monitor and protect raptors and other neotropical migratory birds. During her non-quilting time, Gail may be found working with schools and various interest groups in the community, promoting raptor and conservation awareness, flying in a small aircraft locating nests of large raptors and eagles, or conducting surveys on foot in remote, back-country areas of New Mexico. Several non-releasable, permanently injured education raptors are housed in outdoor flight cages at her Albuquerque home.